Manufacturer: A.O. Smith Water Products Co., of Ashland City, Tenn. Hazard: The water heaters can accumulate soot on the burners, posing a fire hazard. 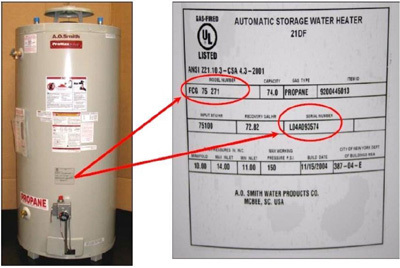 Description: The recall involves 75-gallon propane gas water heaters. The heaters have the name "A.O. Smith," "Reliance," "Apollo," "State," or "Maytag" on the side of the unit. The model number is located on the rating plate. Only units with the model numbers listed below and manufactured between January 2004 and July 2005 are included in the recall. If your unit has one of the model numbers listed above, locate the serial number on the rating plate to determine if it was manufactured between January 2004 and July 2005. The serial numbers of units manufactured between January 2004 and July 2005 are listed below. Installed by: Independent contractors and plumbers nationwide from January 2004 through July 2005 for between $460 and $1,130. Remedy: Contact A. O. Smith to arrange for installation of free repair. Manufacturer: Dan Dee International Ltd., of Jersey City, N.J. Hazard: The decorative covering on the candles can ignite, posing a fire and burn hazard. Incidents/Injuries: Wal-Mart has received six reports of the candles catching fire including two incidents that resulted in approximately $6,200 in property damage. Another incident resulted in minor property damage. No injuries have been reported. 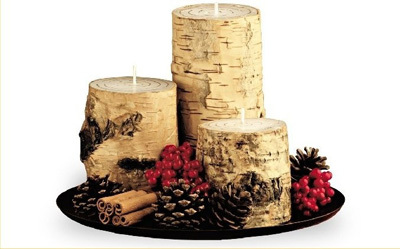 Description: One recalled candle gift set includes three birch bark-covered candles. Each candle measures 3 inches wide but vary in height from 3 to 6 inches. The candles are displayed on a stand with pine cones, cinnamon sticks and red berries. 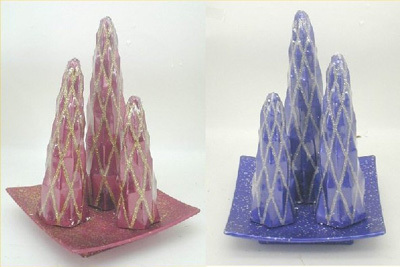 The second recalled candle gift set includes a display stand with three pyramid-shaped candles varying in height from 8 to 12 inches. The candles are either blue with a silver glitter criss-cross pattern or red with a gold glitter criss-cross pattern. Both candle sets were sold under the Holiday Time™ brand name written on the box. Sold exclusively at: Wal-Mart stores nationwide from September 2004 through January 2005 for about $10. Remedy: Consumers should immediately stop using the candles and return them to Wal-Mart for a full refund.